As your practice management provider, we work closely with you to ensure our services help you make sound business decisions so you can focus on what matters. We provide the expertise needed to handle complex medical practice issues, from business development to human resources management and provider credentialing. We strive to provide timely billing and account reimbursement services for your practice. With years of experience, our team is qualified to handle the complexities presented by surgery billing and modifiers. Our experience in understanding the surgical, procedural, and diagnosis codes and billing go hand-in-hand. Anesthesia billing is complex, requiring special attention paid to time and acuity components, as well as different levels for each that the insurance company will pay. With more than 70 years of combined billing and management experience, Practice Management & Billing Solutions can provide customized support to your practice. Practice Management and Billing Solutions, Inc. is a full-service anesthesia practice management company. We specialize in anesthesia billing, while offering a complete array of other business services specific to anesthesia practices. 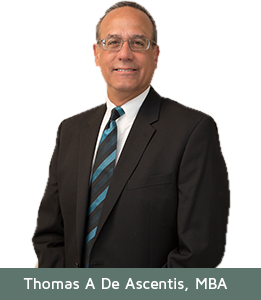 Owner and consultant, Tom DeAscentis, has over twenty years of experience in healthcare financial management and anesthesia billing; his team of anesthesia billing specialists are dedicated to improving the health of your anesthesia practice. PRACTICE MANAGEMENT & BILLING SOLUTIONS, INC.